Dare to be Different — In my farming community, I always see the cows facing the same direction. What if one cow from the herd faced the opposite way — and was red? "Originality exists is every individual because each of us differ from the others. We are all primary numbers divisible only by ourselves." — Jean Guitton. 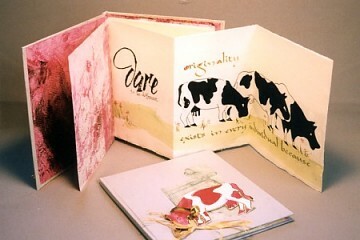 Cow sketches photocopied onto Arches Text, with watercolor, gouache lettering. Book 5″ x 6″ (12.7cm x 15.2cm).